The following is the script of a presentation I gave at the International Symposium on Practice as Research in Hong Kong on 4 December 2017. The slides (mostly just text) can be downloaded as a PDF here: slide-deck-documentation. Many of the ideas will be familiar to regular readers of this blog but perhaps reading them placed together in this way might be useful. I’m a dance-artist: I choreograph, I dance, and – broadly speaking – I’m interested in the mysterious ways of the body in performance. But this morning I’m here to talk about issues and ideas to do with documentation in practice-as-research. I’ll speak mostly from a UK perspective – the one I know best and am deeply involved in – but most of what I’ll cover and propose will be relevant in other places where artist-scholars are working in and through practice. It’s 2002 and I’m mid way through my PhD in choreography. My research is about memory, remembering and improvisation, and I happen to be the first practice-as-research student at the Victorian College of the Arts in Melbourne (affiliated to the University of Melbourne). This means that many of the rules and regulations about practice-as-research are being made up as I am going along. One of these regulations stated that there could be no more than 6 weeks between the presentation of the performance component of my research, and the submission of the written thesis. This seemed like an absurdly short amount of time to reflect critically on the artistic practice. And so, I decided not to submit the performance itself as a so-called “assessable outcome”. Instead, I was able to present the art work, and then take as much time as I wanted to develop some writing after that presentation. As a consequence I started to inhabit the world of performance documentation. It was really just an accident. Because of my decision, the research became more about the nature of documentation and less about the practice of choreography through improvisation. It felt a bit like a betrayal towards my discipline and my own developing identity as a choreographer. The entire PhD called Indelible became a kind of ‘remembering’ – what I eventually called a ‘hypermedia remembering’ – and through it I inadvertently ended up overwhelmingly valorising documentation in performance. This story reveals quite a bit about the conditions under which artist-scholars are asked to work in and around higher education. And these are conditions that have changed markedly since 2002. The academic regulations weren’t designed by creative artist-scholars, but were designed to regulate (for better or worse) how we work, and what we produce. You might say that it is only because of those regulations that I started thinking deeply about documentation, and I guess they are also why I am standing here today. But the story is also important because documentation practices are rather seductive for artist-scholars. I remember for instance in 2006 Robin Nelson warning a group of visual ethnographers of the risk of fetishising documentation in practice-as-research – and these were artists already working in a discipline (and medium) that has a less problematic or troubled relationship to documentation than we do in theatre, dance and performance. There is a paradox that underpins much of what I want to discuss this morning, and it has been brought into sharp relief by the emergence of practice-as-research with its focus (often institution led) on the importance of documenting performance work. Indeed, if I had a dollar for every time I’ve heard the words, “As long as you document it you’ll be fine …”. The paradox is a tension between the imperative, need or desire to perpetuate or preserve the existence of a performance work, and the view that part of performance’s essence or strength is inherent in its disappearance through time. It is based on the cliche (or truism depending on your perspective) that performance’s power lies – at least in part – in its ephemerality. There is a third part to the paradox that complicates it somewhat: it is the idea that ways of knowing and experiences are embodied or perhaps felt in the liveness of the performance events themselves, and that any attempt to document or translate these experiences or understandings alters them. This distinction between disappearance and liveness is an important one. 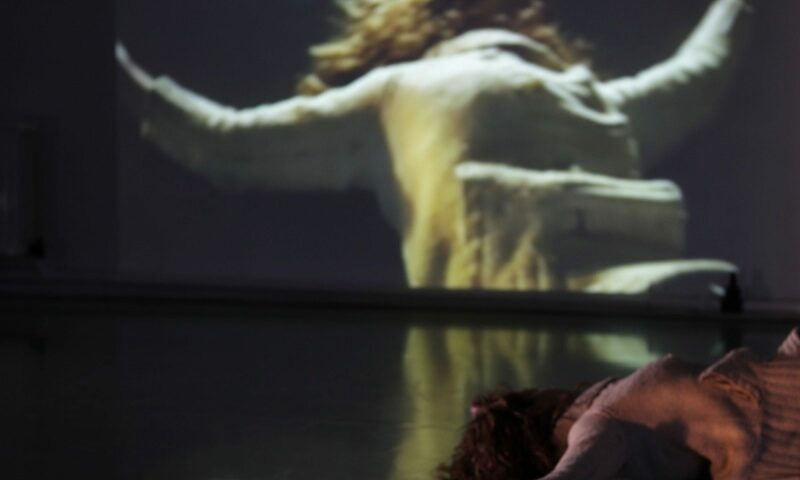 Although some scholars, most famously performance theorist Peggy Phelan back in the early 90s, argue that live performance’s nature is expressed through disappearance, it is not necessarily agreed that the phenomenon of disappearance sets apart live performance from mediated materials. For example, it is possible to imagine some kind of entirely mediated performance or installation which, through technological invention, eats itself or disappears either metaphorically or literally. And so the state of liveness, which is related to but not synonymous with ephemerality, is also an important aspect of the paradox. The paradox helps us to grapple with the tensions of documenting performance, but it is dependent for the most part on a rather traditional conception of a performance project: I have some kind of live work, and I need to document it because in practice-as-research we are told that as long as we document the work it will be fine. But there are other ways to conceive of artistic research projects, and one of the beautiful strengths of practice-as-research is that it can afford artist-scholars the space to drastically rethink the ways we imagine and present our work. But more of this later. The paradox between preservation, disappearance and liveness leaves artist-scholars with two key and often mutually exclusive responsibilities: 1) to recognise the need to openly share and make accessible the work, materials and understandings of their research; and 2) to value and prioritise the nature and integrity of their materials, practice and research. For example, there could be tension – or competing interests – because the nature of the artistic practice might explicitly foreground loss or even ephemerality; or perhaps the artist-scholar has a strong sense that the work is dependent on ways of relating between audience and performers that demand face to face exchanges or closeness. But, for the sake of the particular discipline (dance, theatre, performance, etc) and development of practice-as-research as a set of methodological principles, it is vital that there is increased access to previous research and work. There is generally no problem for current researchers to access written components of practice-as-research projects, but getting access to the creative work is often nigh impossible. The tendency and obvious danger is that each artistic research project becomes its own bubble with little or no explicit or traceable reference to other artistic-scholarly work. If research is about developing ideas, approaches, attitudes, and practices through time, then this lack in practice-as-research is potentially catastrophic. Bubbling underneath these ideas, there seem to be distinctly different attitudes to documentation for two different groups. The first group is PhD and increasingly MA students working towards degrees through and in practice. Performances or other dynamically creative works should be available for the examiners to experience as live practice, and where possible captured in audio and video on CD, DVD, appropriate format or other similar appropriate medium to be submitted with the written thesis as a record of the live event. The spirit of the regulation is undoubtedly to capture the live bit so that others can see it later on. This spirit is well intentioned. But the words “appropriate” (in relation to format and medium) and “where possible” are filled with possibilities for PhD students. Appropriate to whom? Appropriate for what purposes? When is this kind of capture ever possible? I’d be begging the students I work with to ask themselves, “What is an inappropriate format or medium?” You might say that the words appropriate and where possible provide beautiful loopholes that can be exploited by students depending on their projects, interest, drive and curiosity. There is productive tension for practice-as-research students between the regulations (that they are required to follow) and their own creative work. The regulations provide the constraints and conditions for students to employ and deploy complex, provocative, nuanced and even conventional responses to the performance-documentation nexus. The second group is people working in the academy developing projects through and in practice; these are usually employed lecturers or professors. For these people the current conditions most commonly involve producing research that at some stage becomes part of neoliberal monitoring and assessment exercises. In the UK this is called the Research Excellence Framework (REF), in Australia the Excellence in Research for Australia (ERA), and in NZ the Performance‐Based Research Fund (PBRF). As a New Zealander I’d like to mention that I’m proud of NZ for avoiding the cliche of the three-letter-acronym and thereby beating Australia by four letters to three. It’s not just rugby we are good at. Since 2006 I’ve participated in two REFs in the UK, and what is fascinating is that I’m yet to hear anyone complain or express concern about simply providing some kind of fairly basic video evidence of practice-as-research through performance. For all other types of output, the [institution] must provide an electronic copy wherever this is available; or where it is not, a physical output or appropriate evidence of the output. There’s that word again: appropriate. What is different – in my experience – is that artist-scholars in the UK (and I’m definitely guilty of this very thing) don’t use the research excellence framework as an opportunity to test and expand our understanding of the role documentation might play – or not – in remembering and providing access to performance. Is there too much at stake? Or is it the case that we all know this isn’t right or appropriate or even close to what should be happening, but no one seems to be bothered? In this second group of artist-scholars , certainly in relation to the research excellence framework or other performance-based measurements, we seem to have fallen into a trap so rigorously and eloquently outlined by Adrian Heathfield, Fiona Templeton and Andrew Quick back in 1997 when they expressed concern that documentation is often seen as “transparent and non-affective”. When, what is really happening is that documentation is affective, opaque, and indeed doing its own kind of work that is dependent on the type of project in which it is a part. It would seem that for these two groups of artist-scholars – students and lecturers – there are two different sets of written and unwritten rules which influence the attitudes of the people in the groups. The more interesting questions and solutions are revealed by the first group, and more problematic ones emerge with the second. The two groups share the same responsibilities but their attitudes tend to differ markedly. But there is another way of thinking about this entire situation, and it has emerged from the ways in which PhD practice-as-research students have considered and experimented with the methods and tools for presenting artistic-scholarly work. Up until now, I have been talking about a simplistic structure for a practice-as-research project through performance making or choreography. This is still the surprisingly common situation in practice-as-research PhDs where the artist-scholar creates an artwork, documents it (usually through video), and then writes a contextual thesis that talks to, about and around the artwork. It’s often regulated as a 50–50 split between, dare I say it, practice and theory. As if writing isn’t a practice, and as if performance can’t do theory. The absurdity of this structure is that the artist-scholar often loads the artistic work with their heart and soul (and indeed their vulnerability); the documentation also reflects the status of the artwork in their minds as being the original thing, and the documentation as some kind of “best betrayal” as Annabelle Melzer wrote in 1995; while it is the writing that is dissected and challenged in the examination process. The word documentation itself seems so limited and I suspect that we have defaulted to it due to its availability and accessibility (both very good reasons), and also because in the early days of practice-as-research there was a tendency that still persists for projects (as I’ve already said) to involve making an (art)work, documenting it, then writing about it. It was all rather tidy, at least from the outside. I don’t think we need a different word from documentation, but rather need to rethink the way we imagine the scope and shape of our research projects. This would help to make sense of the paradox I’ve discussed, loosen the linear temporal relationship between performance and documentation, and also help to enrich the the nature of the practice-as-research work we make, and how it might make possible alternative ways of knowing. The implications for practice-as-research are clear. With the crystal as an adopted metaphor, each artistic-scholarly research project forms a singular entity with many surfaces. These surfaces – or materials, experiences, activities, events – enable the reader, viewer or audience to access different perspectives or understandings of the same singular entity. With such a model, documentation is no longer other to performance or some form of poor cousin, and writing isn’t some strange way of pointing theory at a performance that happened in the past. Rather each surface of the project provides different ways of accessing or understanding the research project. You might imagine someone encountering the various practices and materials that comprise this multi-surfaced metaphorical object and having a very personal, and independent experience that is entirely distinctive from another person approaching the same materials and practices from a different perspective. Such distinctiveness in the experiences makes possible a constructivist attitude towards the epistemic power of practice-as-research that defies our capacity to tie down or reduce what understandings are made possible by it in any single research project. In other words, practice-as-research seeks to open out understandings rather than resolve itself in agreement or unified easy to explain “findings”. In many respects, this crystal model or metaphor demands that artist-researchers step back enough from their practices so that they are visible (or able to be conceived of) as part of a singular project. And by practices I mean all of the practices involved in a research project: writing, analysis, reflection, theorising, creating or making, performing, and other non-textual tools. The crystal model or way of imagining practice-as-research makes multiplicity possible – even essential – in our practices and work. Each surface – or aspect – has different epistemic and ontological qualities and values, and these are able to be given the space and complexity they deserve, rather than being part of an inappropriately linear progression from creative work to documentation to written contextualisation. In other words, just because you document it, it won’t necessarily be fine.